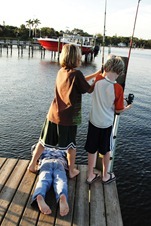 I didn’t fish much in Michigan, but down here I learned the best way from my friends, Garrett and Tanner. 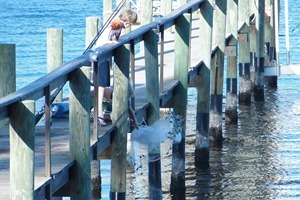 You will need three fishing poles, hose, dock, large bucket, large cast net, cutting table and knife. 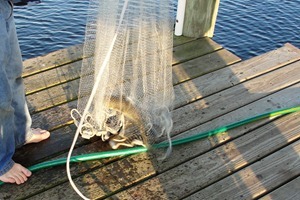 First, you throw the cast net. You don’t need to bring any bait so please, don’t. 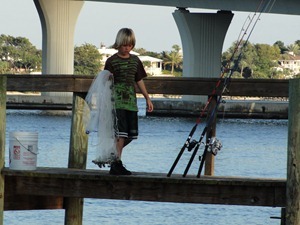 The cast net is for catching the bait. 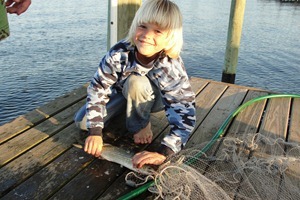 If you catch a big fish, skip to the big fish part. 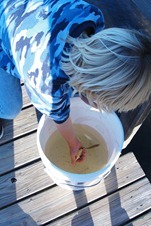 If you catch a small fish put it in the bucket with water right away or hook it on one pole. Don’t hook it in the stomach, hook it by the top fin and then cast the fishing pole fast because you don’t want it to die, you want it to swim. Then repeat two more times, so you have fish for the other poles. If you have three fish swimming around, then there is a better chance that one will get eaten. If you catch a bigger fish in the net or on the pole you can use if for shark bait or cut it and clean the guts out and eat it. The shark bait catching part is kind of gross, so I’m not going to type any more. This entry was posted on Friday, January 22nd, 2010 at 3:16 pm and is filed under Florida. You can feed this entry. Both comments and pings are currently closed.